A memorial to Muslim soldiers who died during the First World War is to be restored to mark the Centenary. The former cemetery, at Horsell Common near Woking, has been repaired following a grant from English Heritage. Originally built in 1915 the area was designed to be the last resting place for Muslim soldiers of the Indian army. However, the remains were later transferred to the Brookwood Cemetery. The men’s names are still recorded at Horsell and they hint at the caste-defined society that still exists in India and Pakistan. Among the likes of Alla Ditta Khan of the 15th Lancers and Mirza Iqbal Ali Beg of the Royal Military College are lower-caste men referred to just by one name: Abdullah, Babu or Hanza. 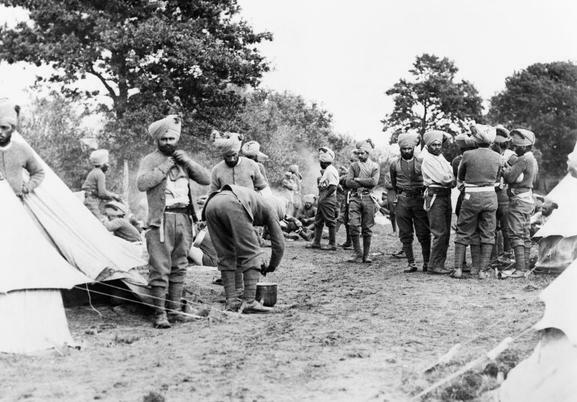 The UK’s Secretary of State for Culture, Sajid Javid, said: ‘Over one million troops from pre-partition India fought as members of the British Armed Forces in the First World War, many of them Muslim. The idea is to create what the council refers to as an, ‘Islamic-style peace garden’. This will contain 27 Himalayan Birch trees planted to symbolise the men who were once buried here. Pink and white heather will be planted in strips, pointing towards Mecca. This entry was posted in News, Soldiers of the Great War and tagged Alla Ditta Khan, First World War Centenary, Horsell, India, Islam, Mecca, Mirza Iqbal Ali Beg, Muslim Burial Ground, Muslim soldiers, Pakistan, Sajid Javid, Woking, World War One, WW1. Bookmark the permalink.